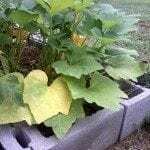 I planted yellow squash in my raised garden and the plants are beautiful, but when the squash are about 2-3 inches long, they start to shrivel and drop off. Sometimes there is a purplish spot at the end of them. What can I do to get them to grow to maturity?